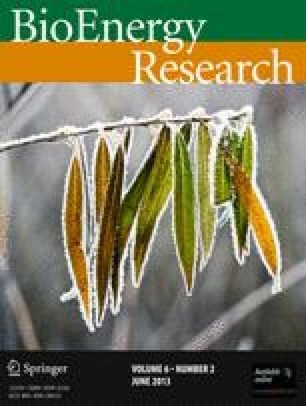 The present study was undertaken to obtain insights into the productivity determinant traits of mulberry (Morus spp. L.), a potential bioenergy tree crop. Our objectives were to identify leaf functional traits and stem wood characteristics that are correlated to biomass yield of mulberry. Based on the growth performance, six mulberry genotypes from different performance groups including high (Selection1 and Thaibeelad), average (Mysore Local) and poor (Triploid10, Jhoropakari and Selection1635) were selected for the study, along with a reference high-yielding genotype (Victory1). The study was conducted in Southern India for two consecutive years, covering two experimental seasons including exp season I (July 2009 to October 2009) and exp season II (July 2010 to October 2010). Mulberry trees were cultivated in a short-rotation coppice system under well-irrigated optimum farming conditions. Data were collected on biomass yield along with several leaf-level physiobiochemical characteristics and wood quality parameters. Significant genetic variation was recorded amongst the genotypes in most of the studied parameters. Fifteen out of a total of 22 traits, used in computing correlation coefficient matrix, were found to correlate with aboveground biomass yield. Light-saturated rate of photosynthesis, performance index, leaf nitrogen content, minimum leaf water potential and leaf-specific hydraulic conductance showed strong positive correlation with biomass productivity. Wood density, wood cross-sectional area and fibre cell density exhibited tight correlation with woody biomass yield. In conclusion, the identified 15 characteristics could be useful in the selection of suitable mulberry genotypes for higher biomass yield. The online version of this article (doi: 10.1007/s12155-012-9270-7) contains supplementary material, which is available to authorized users. The Senior Research Fellowship from the Council of Scientific and Industrial Research (CSIR), Government of India, to A. Guha is gratefully acknowledged. Facilities through the FIST grant to the Plant Science Department from DST, New Delhi, are acknowledged. Plant materials were provided by Central Sericultural Germplasm Resources Centre (Hosur, India) and Regional Sericultural Research Stations (Anantapur and Salem, India). Thanks are due to Dr. T. Sujatha for facilitating leaf nitrogen analyses. We acknowledge the Central Instruments Laboratory (CIL) of the University of Hyderabad, Hyderabad, India, for help on Scanning Electron Microscopy and Confocal Laser Scanning Microscopy. We thank K. M. Sekhar and B. S. K. Chaitanya for their technical assistance. We also thank our field assistants L. Lakshman and K. Vinod for the raising and maintenance of the mulberry plantation.